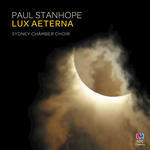 Lux Aeterna : Sydney Chamber Choir / Paul Stanhope. Fiant Luminaria : for SATB choir, organ, piano, timpani and percussion / Paul Stanhope ; text: Genesis 1 : 14-17. Fiant Luminaria is a stand-alone movement drawn from a larger choral/orchestral work "The Heavens Declare" which was composed in 1999 and sets Latin vulgate biblical texts about the celestial. This movement deals with the part of the creation story about the formation of the lights in the sky, the separation of night and day, the moon and sun and the stars. I have approached this text as though it were a Dreamtime story - told with wide-eyed wonder and passed down from one generation from the next. Percussion and piano textures suggest sparkling and chaotic celestial figures where the organ grounds the harmonic material with deep, sustained drones. Choral lines descend from high soprano notes into chords which merge in and out of clusters back to clearer harmonies. The piece moves from contemplative moments into an energetic climax with the words 'et vidit Deus bonum' - 'And God saw that it was good' - before the music drifts off once again into the ether. Instrumentation: SATB choir, organ, piano, timpani, percussion (2 players), (plus auxiliary percussion which may be played by a chorister).